Off-grid solar power generated in remote locations could benefit from li-ion energy storage in combination with diesel generators (image courtesy of Shutterstock). Saft storage system in Coleville Lake (image courtesy of Saft). There is a growing worldwide trend for microgrids as communities and industrial facilities in locations that are remote or have a weak grid connection are seeking to improve the reliability and autonomy of their electricity supplies as well as meeting growing demand and optimising their operating costs. Conventionally, operators have relied on diesel generators. But operators are now turning to renewables and especially solar photovoltaic (PV) installations to reduce their reliance on diesel fuel. Creating schemes in which diesel generation and PV plant complement each other can offer considerable savings in terms of the costs of fuel purchase, transport and handling as well as maintenance, since diesel gensets are required to operate for fewer hours. There are also environmental benefits from reduced greenhouse gas emissions. Microgrids are often off-grid but can be grid connected. If so, they can be disconnected from the grid to operate autonomously, ensuring continuity of power supply in the case of an outage. This approach is common in locations where the grid can be unreliable, such as storm-prone areas. 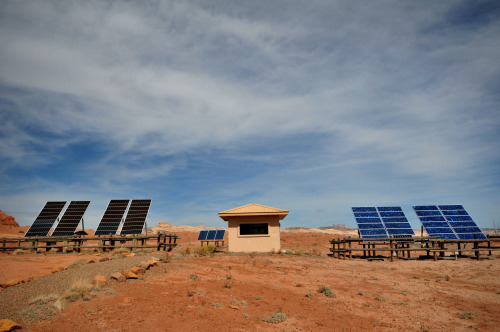 Off-grid microgrids typically provide power for remote villages, industrial operations and military bases. These usually have a very high cost of generation as they are totally dependent on diesel fuel. Adding renewables to microgrids in the form of solar and wind power is an increasingly attractive option. The cost of solar and wind per kilowatt-hour is significantly lower than diesel but because of the intermittency of renewables, diesel gensets are still needed to ensure the stability of the grid. Using standard power electronics, PV can contribute up to 20 to 30 percent of the power that would be generated by the diesel genset during daytime hours. Adding dedicated software can increase the penetration of PV to 50 to 60 percent. When an energy storage system (ESS) is added, an operator can maximize the contribution of renewables, increasing the penetration and harvesting all of the PV power. It is possible to realise fuel savings of 50 to 75 percent. Li-ion battery systems have emerged as the technology of choice for energy storage due to the chemistry’s high energy density that enables significant levels of storage capacity to be packed into a relatively compact footprint. Li-ion ESSs are now able to store energy at the megawatt scale, and integrated containerized systems can be connected in parallel to deliver multiple megawatt-hour storage capacity. From a technical and economic point of view, energy storage has three drivers. The first is that increasing the usage of PV reduces the running hours of the genset. Without energy storage, excess PV would be lost (or curtailed) but an ESS can store excess PV for use later. In addition, the power output of the PV panels are smoothed so that the genset will need to start and stop less often to compensate for the variation in PV. Second, the diesel genset will be able to run at its point of maximum efficiency, rather than ramping up and down to meet changing demand. This reduces operational and maintenance costs as well as idle running to provide spinning reserves. And lastly, integrating energy storage enables an operator to operate their genset only when needed to support loads or to charge the battery. Consider an industrial microgrid with a 12 MW load. This would typically be supplied by six gensets, each rated at 2 MW. SMAi has modelled the impact of adding 60 to 150 percent of PV production (between 7.5 and 18 MWp) and energy storage to fulfil the roles of power smoothing and time shifting. Power smoothing requires a relatively small ESS that can deliver power for 20 minutes to compensate for changing weather conditions. In this case the ESS helps to ensure a smooth power output and delivers savings by avoiding the need to ramp the diesel gensets up and down. However, the gensets are still required to provide spinning reserves and recharge the battery when PV production is low. Without an ESS, an operator can achieve incremental savings as additional PV is incorporated. But introducing a battery helped to realise significantly more savings, in fact for power smoothing a medium sized battery is a better option for optimizing PV penetration than adding extra panels. In this case, a battery sized at about 40 percent of the system power (4.6 MW) and 20 minute discharge is sufficient to enable a 50 percent decrease in fuel consumption. This is estimated to save up to four million litres per year, with PV panels sized between 7.5 and 11.5 MWp. Any further increase of battery power would only allow for marginal additional fuel savings. For time shifting applications, a larger battery will supply two hours of energy storage so that PV energy generated during the peak hours of daylight can be used during the hours of peak demand in the morning and evening. The larger battery used in this mode enables greater levels of PV to be integrated. At up to 18 MWp of additional PV, this represents up to 150 percent of the capacity of the diesel gensets. Running the microgrid using only PV and energy storage in this typical system, there is potential for diesel savings of almost 10 million litres per year. This does require careful system sizing and sophisticated control electronics and control as there is no spinning reserve immediately available. In this case the battery must be able to provide all the power if there is a sudden drop in PV production. The rule of thumb is that an operator can typically optimise fuel savings without a battery when PV penetration is below 50 percent, with a medium-sized ESS when PV penetration is between 50 and 100 percent and with a large ESS when PV penetration rises above 100 percent. In reality, the PV penetration and diesel savings possible at a site depend on many variables including the load profile, the PV generation profile, the environmental and economic conditions, the nature of the load, and the reliability of the connection to the main grid, if one exists. There is no single ESS that will meet the needs of all sites. Each ESS must be considered as part of a wider system and it requires expertise to identify the optimum ESS and PV system along with well adapted controls to maximise fuel savings, integration of PV energy and minimize costs. Saft contributes to this process with high resolution, Matlab based modeling of the electrical and thermal characteristics of the Li-ion battery system. This exactly mimics the real battery behavior, including contactor management, and makes it possible to anticipate the evolution of battery power, state of charge and ageing over time in a given application with very dynamic charge and discharge operation. In the extreme north, a small microgrid serves the 150-strong community of Colville Lake, located 50 miles inside the Arctic Circle in northern Canada. The 150 kW peak and 30 kW base load was met by two 100 kW diesel generators. A major challenge for the community is that diesel deliveries can be made only once a year via an ice road. The distribution network operator, Northwest Territories Power Corporation (NTPC), decided to add a further 150 kW of diesel generation supplemented by 50 kWp of PV. A mathematical model of the grid determined that with an ESS, the PV can be expanded up to 140 kWp and quantified the potential fuel savings to create the business case. 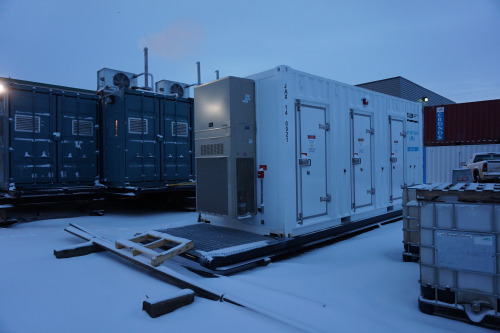 Saft has deployed an Intensium® Max 20M Medium Power (IM 20M) battery container with 232 kWh of energy and a 200 kW Power Conditioning System from ABB. At the opposite extreme, Isotron has implemented an ESS for the world’s largest PV-diesel hybrid microgrid located in the town of Cobija, in Bolivia’s Amazon rainforest. The remote community is not grid connected and depended on 16 MW diesel generators and 5 MWp solar PV to meet its 8 MW load – a PV penetration of 62 percent. The grid operator ENDE (Empresa Nacional de Electricidad) wanted to extend electricity coverage and reduce diesel consumption. To meet this goal, Saft has delivered an ESS capable of delivering 2.2 MW and with a capacity of 1.2 MWh. Since it was commissioned in December 2014, the ESS has enabled the operator to switch off two gensets, saving two million litres of fuel per year. Energy storage is typically considered when operators want to reduce their costs and reliance on diesel power and the increasing competitiveness of PV means that hybrid schemes are becoming more attractive. However, to convince investors of the business case, energy storage must deliver a high return on investment and show substantial savings and advantages. As well as this, there can be no reduction in reliability and power quality. Stable frequency and voltage are essential in remote microgrids where communities have high dependence on a reliable power supply. Using an ESS as part of a PV-diesel hybrid scheme requires cooperation between the developer and supplier and a high level of expertise to develop the optimum layout and size of each element of the system. It is also important to understand how best to retrofit ESS and PV to existing diesel plant. Michael Lippert is marketing and business development manager for Saft.